The tragedy, the deadliest workplace disaster in New York City’s history prior to the Sept. 11, 2001 World Trade Center attacks, caused the death of 146 garment workers. 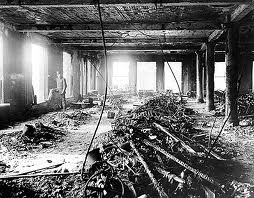 Mostly young immigrant women, they died from the fire or jumped to their deaths from the top three floors of the 10-story building. 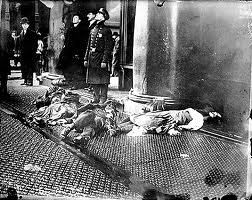 Many were unable to escape the inferno because the plant’s managers had locked doors to some exits and stairwells to prevent pilferage and unauthorized breaks from work.3 “141 MEN AND GIRLS DIE IN WAIST FACTORY FIRE” read the New York Times all-caps headline on a front-page article the following day, accompanied by grisly photographs of the event and aftermath. Perkins later served as chief investigator of the commission charged with investigating factory conditions statewide. Following on the commission’s findings, the New York State Legislature passed labor protections for women and children and created a State Department of Labor to enforce them. Labor unions gradually gained strength over the following decades and, as part of FDR’s New Deal in the 1930s, strong worker protections were enacted into federal law, including the National Labor Relations Act. But even in the depths of the Depression, substantial numbers of Americans continued to have reservations about the impact of organized labor. A Gallup poll in mid-1937 found 61% hoping that labor leader John L. Lewis would fail in his effort to organize Ford Motor Co. employees into a CIO labor union.4 Two years later in February 1939, Gallup found that, by a 51%-to-21% margin, the public favored requiring every union to obtain a permit from the federal government. A 1939 Roper poll found only 20% supporting always requiring workers to join unions, with 11% saying “sometimes” and 61% rejecting the idea outright. Gallup and Roper opinion polls from the period show substantial majorities opposing mandatory union membership and favoring federal government controls on unions. In a March 1941 Gallup poll, still prior to the U.S. entry into World War II, 68% of Americans expressed the view that labor union leaders were not “helping the national defense production program as much as they should.” A 56%-majority thought business leaders were trying harder to help defense production compared with only 10% who gave labor leaders more credit for such effort. Most tellingly, in an October poll that same year, fully 61% said they believed that many labor union leaders were communists and fully 74% deemed union leaders to be racketeers. Still, despite these specific reservations, Gallup polls found that overall attitudes toward labor unions were positive in the late Depression years, with 72% saying they approved of unions in a 1937 poll. While that number declined to 61% in 1941, it re-climbed to a peak of 75% in a 1957 Gallup poll. In subsequent years, support for unions, while generally positive, bobbed up and down. Gallup union-approval readings fell into the 50%-range in the high-inflation years of 1979 and 1981, but rebounded in the prosperous late 1990s, hitting a peak of 66% by the turn of the century. Similarly, Pew Research polls recorded attitudes toward labor unions peaking at 63% positive in March 2001. More recently, as the economy has faltered, unions have lost support among the public. In 2009, Gallup found union approval dropping to 48%, an all-time low in its series dating back to the 1930s. Majorities in a February 2011 Pew Research survey still saw unions as having positive effects on the salary and benefits of covered workers (53%) as well as on working conditions for all American workers (51%) — although responses were divided on whether unions have a positive or negative effect on workplace productivity (34% to 30%) and increase the availability of good jobs in the U.S. (32% to 33%). Most tellingly, however, the survey found only 45% expressing an overall favorable view of labor unions — close to the lowest level in a quarter century — while 41% held an unfavorable view. And while an early-March Pew Research survey found that the confrontation between public sector unions and Wisconsin’s governor appears to have strengthened support among those already holding a favorable view of labor unions (the percentage holding a very favorable view as opposed to a mostly favorable view rose seven points, with the increase concentrated among liberal Democrats and union households), the overall balance of positive and negative views remained unaltered. 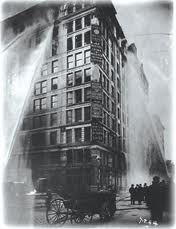 1.Cornell University’s ILR School Kheel Center maintains an excellent website describing the Triangle Shirtwaist Factory fire, the conditions in the garment and other industries at that time it, and subsequent legislation and union activities that sought to prevent its recurrence. In honor of the 100-year anniversary of the fire, the site has been redesigned and many new and updated materials have been included. 4. Unless otherwise indicated, historical public opinion polls cited were obtained from the Roper Center Public Opinion Archives.